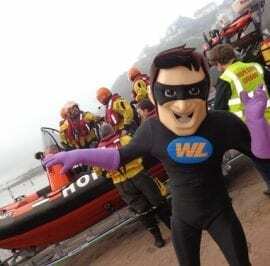 A new Devon Hero visited the Hope Cove Independent Life Boat in Salcombe to thank them for their heroic rescues over recent years. 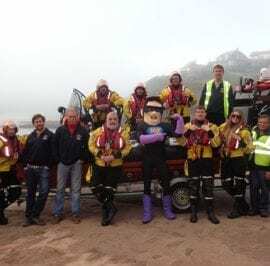 Last year alone a crew of over ten volunteers were called out more than thirteen times to rescues around the South Devon Coast. A recent rescue involved an upturned catamaran off Bolt Tail, one female crew needed prompt medical attention due to injuries and was brought into Harbour Beach and then airlifted to Derriford Hospital. 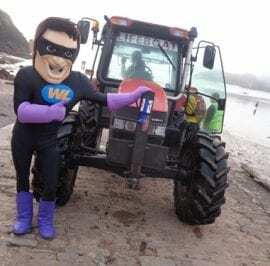 Not all rescues are as dramatic, last year they were called to locate an adventurous cow that had strayed over the cliff. The cow was found alive and apparently uninjured. The local vet was taken on board to encourage the cow to swim to the nearest beach. Hope Cove Lifeboat has existed since 1878 and was originally presented to the village by the masons along with the original boathouse. 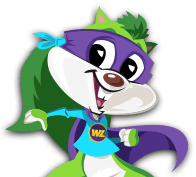 In January 2011 it was granted registered charity status and depends on generous donations. 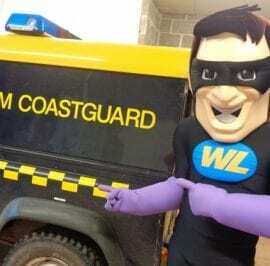 The Hero from Woodlands was excited to see the boat at low tide being pulled into the water on its trailer where it shot off into the sea to practise another rescue. 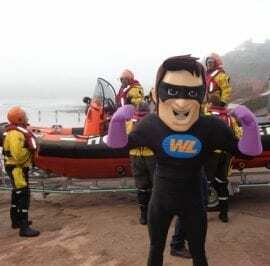 The Hero then showed off some of his most impressive poses to the crew and invited them to Woodlands Family Theme Park to ride his own dingy boats down the turbulent water-coasters.